The day arrived, the day Team Far Kew made their debut on the world stage! 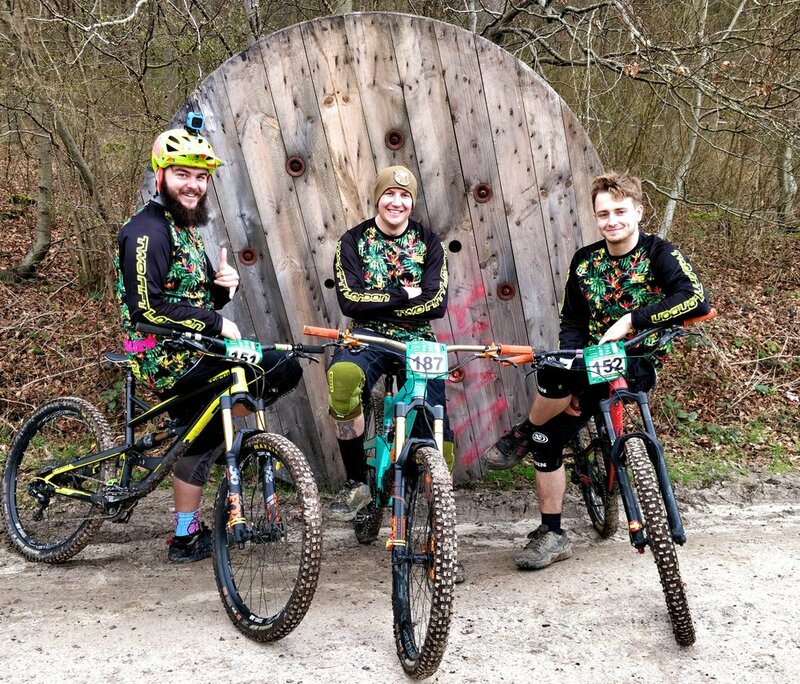 They chose Round 1 of the Southern Enduro Series to get the first taste of this epicness! 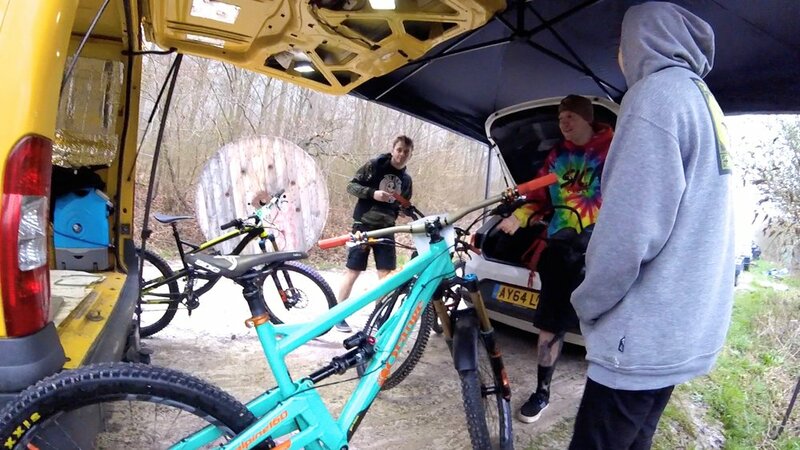 For 2 members of the team, this was their first experience of the Enduro life. Ryan (Mantis) and Will (Tnucsiht) had been convinced by Brad (ZimZimma) to give this series a whirl! Brad had attended this event before and knew what might lie ahead for the team. Last year's event was a mud bath. This year started all the more promising! Upon arrival in the Forest of QECP, the team were greeted by a very foggy scene. The sun wasn't shining but the ground was dry with plenty of grip here and there. With the team tent set up, riders signed on and seat height adjusted for some members of the team, the team was ready for practice. As with any mountain biking, to go down one must first go up! With Enduro racing, you pedal yourself, on a transition, to the top, where the stages start and you're greeted with the descent. The team set off for practice, up the what felt like a never-ending transition to stage 1. At the start of stage 1, this was the team's first insight into what to expect from the racing, a fairly flat and pedally stage with some roots jumping out mid corner to catch a few people out. Stage 1 done without incident. They were then greeted by the transition again, they got quite familiar with this fire road up to the start... They then hit stage 2, this is where the fun began! The top was fairly flat, again with some roots jumping out mid corner to catch you out. The bottom half is where it started to get faster with some off-camber corners and flat turns, Brad thought there was only one way to hit this, foot out and flat out! "Luckily our 250LONDON Jerseys provided all the style we needed!" They then hit a double and road gap after the fire road into a sprint finish! Their legs were certainly getting tested, which they were clearly unprepared for. Back up to the top, they went for stage 3. Stage 3 started off with a tight twisting turns with the trees as close as can be. Will, took getting a "close up" to new levels by almost collecting a photographer in one of the tight corners! This stage had it all, no grip, wet roots, wet leaves and lots of tight berms! With stage 1, 2 & 3 in the bag, they decided to hit the transition up, for stage 4 practice. By now a fair number of people were saving themselves by not using the transition. So, they joined in... As they reached the fire road for the last uphill, they got told off by a marshall for not using the transition. Controversy, for the team in the first outing! Will there be any more? Back at the top, ready for stage 4, they decided to throw Ryan out front to see how he got on, Will 2nd followed by Brad. The stage was a fun one, small rock garden to start and some off camber turns, things were getting fast. Ryan, lost his cool at the site of a gap jump and Will was too close to hit the jump and not collect Ryan, so had to stop on the jump. He was passed by a chuckling Brad at this site. Will, composed himself and set off again, only to come unstuck by a set of wet roots. This, fortunately, was the only bail from Team Far Kew for the day! It was tough all around for the team to hit the transitions again, as they seemed to go on and on but we sucked it up and kept going. Brad and Ryan set off, as they were in the same class, senior and left Will at the bottom waiting for his masters class start time. Stage 1 went off without any fault from either of the team's riders. Back to the top the boys went. Luckily we had a lovely drinks lady, Brad's other half and the better looking one out of the two, Katie. She greeted us with a Gatorade to refresh us. The boys, refreshed with Gatorade, they set off on Stage 2. Again, no issues with the boys and the jerseys still standing out! The weather had other ideas. A light drizzle had settled in and seem poised to stay. After stage 2 and returning for stage 3 Ryan had cramp in his legs, however, the team rallied around him and convinced him, (more like gave him some verbal abuse which they considered to be encouragement) to complete the race, as he'd come this far! At this point, Will had caught up with the other two and we were able to ride the last 2 stages as a trio. As the team set off following each other for stage 3, this stage was tight and twisty with some off camber turns towards the bottom. The light drizzle had now decided it wanted to be more than just a drizzle and started to rain! Will emerged first followed by Brad, Ryan was nowhere to be seen. He came out cursing blindly, much to our amusement. He decided to have an altercation with a tree. Clearly, the tree won, but don't tell Ryan. At last, they were there! Where is that? The Final transition that's where they were! The boys got their heads down and ground out those final miles on the fire road back to the top. Ready for stage four, the boys had to chuckle at some of our rivals, as they seemed to struggle to stand on the start mound. The laughter was short-lived as it was now their turn. Again they decided to go down as a trio, with Will in the lead. 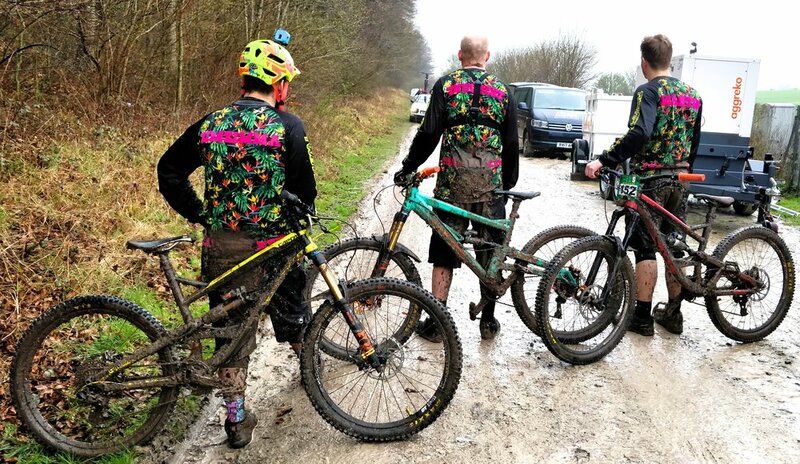 As they set off, down stage 4 the rain and other riders had done their work on the trail, the grip was gone and it was just slop. Will hit the double he had missed because of Ryan. Both Will and Brad emerged close to each other. They waited for Ryan at the bottom to cheer him across the line. 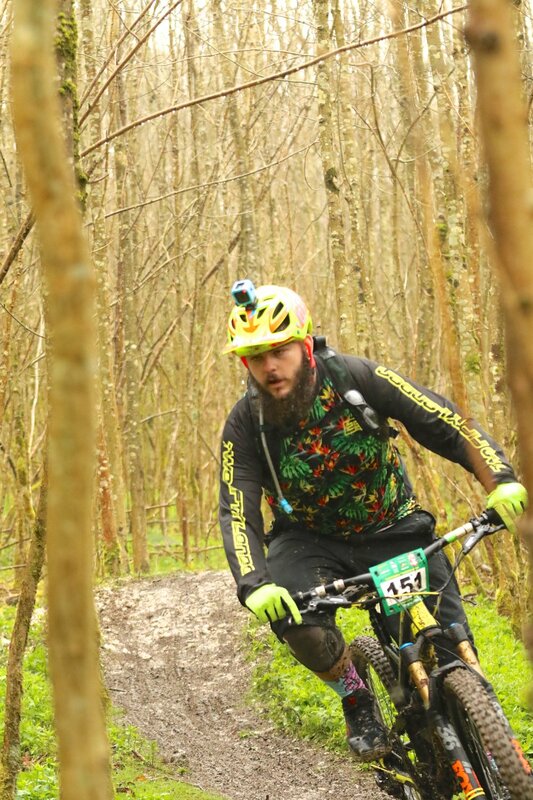 We saw him, pedalling his heart out racing towards the line, only to have another altercation with a tree, possibly a cousin of the tree he had fisticuffs with early, we will never know! The boys were filthy and battered but had the biggest grins ever and are keen for their next outing! Ryan, claimed 24th out of 24, as there was 2 DNF's behind him, and Brad took 19th out of 24. Both of them being in the Seniors. Will, secured 39th out of 65, in what was a packed Masters class with plenty of competition. Will also claimed the accolade of the fastest out of the trio, in which quite rightly gave him bragging rights! Thanks boys for the blow by blow account of your race day and well done, you all survived!